From picnics to Picasso, shopping to Six Flags, we’ve got plenty of options for jingling your bells this Christmas weekend with these 14 fun things to do in and around Arlington, TX. Happy holidays, ya’ll! The sights and sounds of the Christmas season take on distinctive German flavor at the Texas Christkindl Market, one of the most unique holiday destinations in the area. Drop by to shop for not-your-everyday gift items, take in a marionette show, sip a glass of gluhwein (hot spiced wine) and much more. Dates and times: Daily, noon to 8 p.m. (Closed after Dec. 23). The Dallas Cowboys host the Detroit Lions at AT&T Stadium for the last home game of the regular season. Date and time: Monday at 7:30 p.m. Get tickets. Find a nearby sports bar. One of the most popular holiday destinations in the Dallas-Fort Worth region is a dazzling neighborhood light display that’s mere minutes from the Arlington Entertainment District. Enter at the intersection of Randol Mill and Westwood Road, tune your car radio to your favorite holiday station and enjoy! Dates and times: Daily through Christmas night, 7-11 p.m. Get tips to help you plan your Interlochen visit. 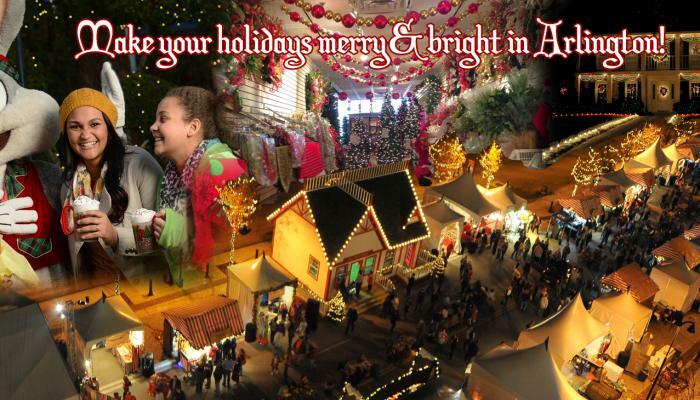 It’s the most wonderful time of the year at Six Flags Over Texas when Texas’s premier amusement park transforms into a winter wonderland that’s filled with fun, thrills, and tons of live entertainment for kids and adults. Dates and times: Daily, 2 -10 p.m. (Closed Christmas Eve and Christmas Day.) Get tickets. Get tips for your Holiday In The Park visit. More than 4 million lights twinkle on the beautiful shores of Joe Pool Lake at Prairie Lights, one of the premiere drive-through holiday light parks in Texas. A don’t-miss for anyone who’s crazy about Christmas! Dates and times: Daily, 6-9 p.m., through Jan. 2 (including Christmas night). Note that traffic for Prairie Lights can be heavy, so arrive early and allow plenty of time to enjoy the park. Celebrate the season in classic style with a turn or two around the ice rink, followed up by a holiday movie, a bite to eat, or shopping at your choice of more than 100 retail destinations. Dates and times: Public skate hours are available daily, see website for details. BONUS: ICE is open for public skating Christmas Day and New Year’s Day. Thirty-minute holiday skating lessons are available Dec. 20-22 and 27-29 at 12:30 p.m. Find out more. The UTA Planetarium is one of Arlington’s most fascinating destinations, so if you haven’t yet made it to a show, take advantage of holiday downtime to cross this wonderful experience off of your Arlington bucket list. Dates and times: Open Tuesday through Sunday during the winter break, call or click for show times and holiday closings. Ditch the cooking and the cleaning in favor of letting someone wait on you and your crew at one of Arlington’s wonderful fine dining destinations or neighborhood gems. Find a great Arlington restaurant. Find a fun Arlington bar or pub. See who’s open on Christmas Eve and Christmas Day. Although Picasso is usually known for his paintings, the legendary Spanish artist actually spent 25 years near the end of his life developing stunning ceramic pieces that speak to his imagination, wit, and quest for new and innovative ways to weave beauty and utility into a harmonious fabric. Through Feb. 12, you can get an up close and personal view of these unusual works at the Arlington Museum of Art. Dates and times: Tuesday-Saturday from 10 a.m. to 5 p.m. , Sundays from 1 pm to 5 p.m. (closed on Christmas Eve and Christmas Day). Go behind the scenes for an unforgettable look at one of the greatest event venues in the world, Arlington’s AT&T Stadium. Noteworthy tour stops (subject to availability) include the press box, the interview room, the Miller Lite Club, the famous Dallas Cowboys fine art exhibition, and of course that legendary playing field. Dates and times: Buy tour tickets. No matter where you are, with more than 80 parks and green spaces in Arlington, there’s bound to be an outdoor destination for picnics, play and more that’s within minutes of your home or hotel. Locations that are especially worth checking out include River Legacy, Veterans Park, Crystal Canyon Nature Preserve, and the Southwest Nature Preserve. Dates and time: Daily from 5 a.m. to 10 p.m. View a holiday Parks & Rec schedule. Did you know that Arlington is home to a number of top-notch (but highly affordable) golf and tennis facilities, including the nationally-recognized Tierra Verde Golf Course? It’s true, and you can find out for yourself just how fabulous they are when you’re working off a few holiday calories at the Arlington Tennis Center or any one of our beautiful municipal golf courses this holiday season.